Copyright Grand Piano Showcase 2015, all rights reserved. Mobile responsive Google-optimized website, with non-blocking CSS/JS, made by BrianLewisDesign.com. Grand Piano Showcase educates you, so you can buy with confidence! Grand Piano Showcase sells only heirloom quality rebuilt and refinished grand pianos. Heirloom grand pianos are expertly crafted early American and German pianos, from the golden age of piano building, using a quality of materials that is no longer available. Unlike cheaper Japanese and Korean pianos which become disposable when it comes time to rebuild, heirloom pianos actually increase in value over time. Our pianos are an investment that can be passed down from generation to generation, and you do not have to pay the price of a new Steinway piano. 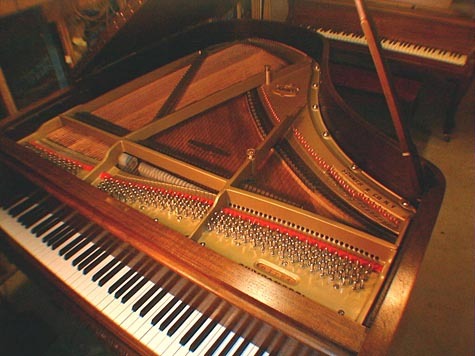 Our used grand pianos play like new, because the mechanical parts are all new. Each piano is rebuilt with new strings and pin block to hold a perfect tune. We restore the action mechanism, hammers, and pads, so the the keys play like originally built. These heirloom pianos produce very full sound and rich tone, because of the extremely high quality materials and craftsmanship of the time period. Our pianos are not only functionally restored, the wood cases are completely refinished to look like new.